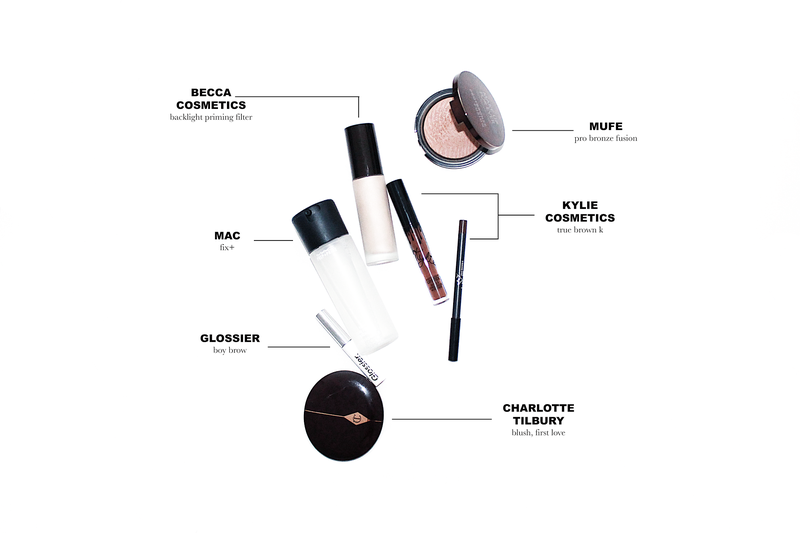 Becca Cosmetics 'Backlight Priming Filter' : I didn't include any skincare in this post, but my Glossier Priming Moisturizer + this + the MAC Fix+ is my ultimate makeup prep. It leaves behind the most glowing base and I love starting with this product and then going over it with a more satin finished foundation. That combination gives the perfect amount of glow without looking oily. MAC Cosmetics Fix+ : I honestly don't know how I went so long without this. It was one of those items that sat in my cart for ages and I just never grabbed. I used this to prep my skin before makeup, set my face after it, and get the most pigment and color out of my eye shadows. The way that it transforms pigments and super shimmery shadows is amazing. It gives that wet, metallic look and it's so gorgeous! Glossier 'Boy Brow' : This is my favorite for easy, quick, out the door mornings. It adds the perfect amount of tint, plumps my lashes, but never makes them hard and crispy like so many other brow gels. I actually hope they make a clear one, just to have for days when I've really done my brows with product and don't want an extra tint to them. Charlotte Tilbury Swish & Pop Blush 'First Love' : This has been the blush that has dominated my makeup bag since the end of February. It's the perfect neutral - not too brown, not too pink, just enough shimmer. It really works with every look. It does have a pretty good amount of pigmentation, so use sparingly and build it up slowly! Kylie Cosmetics Lipkit 'True Brown K' : I couldn't do my March monthly favorites without taking about Kylie. I snagged three of her lipkits this month and I am in serious love. You can read my full Kylie Lipkit Review HERE - which will talk you through formula, longevity, etc. But I decided that for favorites, I'd pick just one to talk about. True Brown K is so gorgeous, it's deep, rich, and makes a serious impact. I love it with minimal, matte eyes and bronzed skin. I also love it with a more dramatic eye for night time. Make Up For Ever 'Pro Bronze Fusion 25I' : This bronzer has also been in constant use since the end of February. It has the most gorgeous warmth to it, just the right amount of shimmer, and it's not super super pigmented. This is something I love in a bronzer because it keeps you from having that - oops I'm now orange moment. I have a fear of hitting pan on this sooner rather than later! Now it's your turn! Let me know in the comments below what you've been loving this past month. Especially since the Sephora VIB is right around the corner...gotta make sure I've got the best stuff on my wish list!